Today’s mission was to find the best ‘sabich’ in Tel Aviv. Sabich is a snack brought to Israel by Iraqi Jews and I was told it was worth waiting in line for. First task was to find the place, in a fairly non-descript place north of the centre of the city. I’ve quickly come to realise that there are NO signs in English/Latin script in Israel and my Hebrew is, well, non-existent. 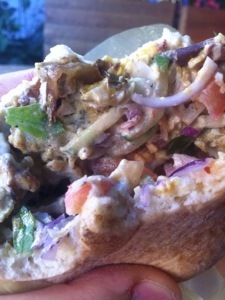 I was told that the owners had regular falafel stand next to their hugely popular sabich stand. That made it easier. Here’s the falafel place, next to a counter half the size but with a queue never less than 15 deep. I’m getting nervous at this point. No English menus, no signs, everyone ordering in Hebrew. When it’s my turn I just do big circular arm movements around the counter mouthing ‘everything’ to avoid any complicated questions. Obviously he understands English and my full sabich is on its way. 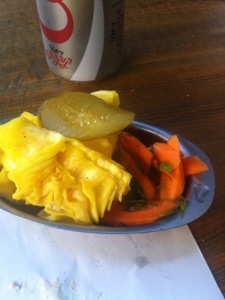 My one task is to collect some pickles from a selection of four or five options. These vinegary carrots with dill catch my eye, plus a little yellow cabbage. So on to the main event. Turns out sabich is a complex beast, so worth taking a look layer by layer. 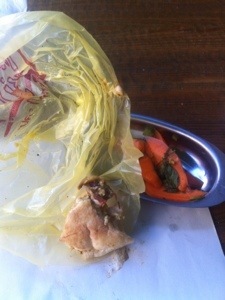 I saw him open a pita, add some sauce and a brownish hard boiled egg which he made great work of breaking up with a fork inside the pita. Then his hands were a blur, adding this and that. 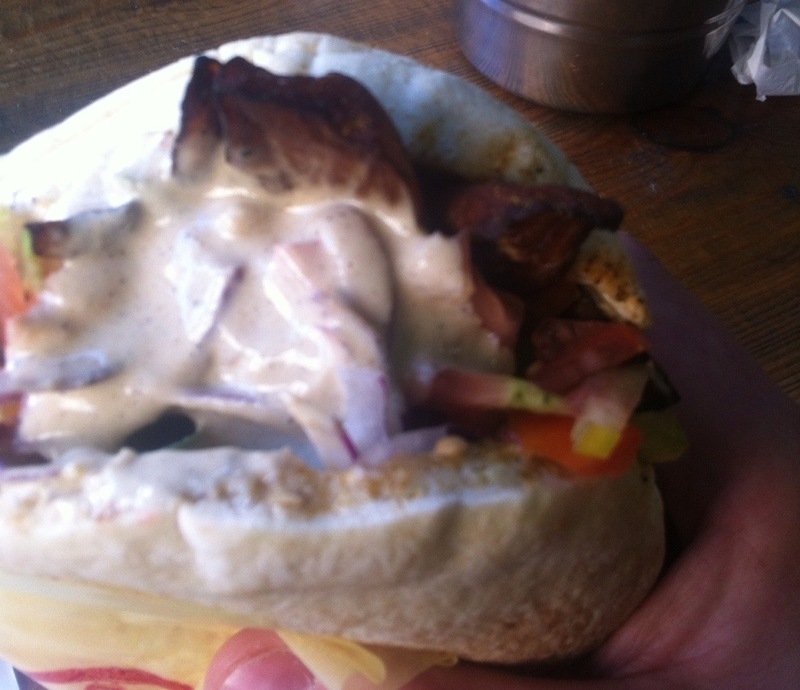 So those brown things sticking out of the top, they’re definitely fried aubergine, the backbone of the sabich. And there’s lots of sauce. Definitely humous but with lots of tahini. Plus a fruity chilli kick which I find out is amba, a spicy mayo sauce. Under the sauce there’s the classic chopped salad – onion, tomato, cucumber and parsley. A little rocket too. And then the egg, roughly chopped, some in the rich sesame sauce, mostly melted into the whole effect. As egg sandwiches go, this was pretty special, far removed from the egg and cress from Boots we’re used to. At some point, there will probably be a Mizrahi pop-up snack bar in Brixton Village Market but until then I’ll just have to stare at the scribbled note in my Lonely Planet trying to work out how to find it again. All over too soon, but someone needed my seat. Oh yes, it’s totally vegetarian.